Hi, Bloggers! First of all, I know I STILL have a Halloween template up on my blog, and I apologize. I have been running into problems trying to update it. It's been a bit frustrating to say the least. I promise to have a more up-to-date design up soon! Well, hope you all had a nice Easter weekend. My toddler dyed Easter eggs for the first time and had a blast! What fun! Speaking of Easter, that is the theme of our most recent challenge over at Digi Galore Challenges. Our sponsor for this challenge is Whoopsi Daisy. Please be sure to check out the main post over at Digi Galore Challenges for the challenge rules and to post your entry. I chose to work with this adorable image of two birds. I tried to stick with a clean, bright design. I colored the image with Copic pens and then added pink Stickles to the flowers. I used one of my Spellbinders dies to cut out the image and then inked the edges with TH Distress Ink in Pickled Raspberry. Love the bright pink! The leaves are a flourish die from Cheery Lynn Designs. The flowers were made with two different La-La Land dies. I added flat back pearls to the centers. 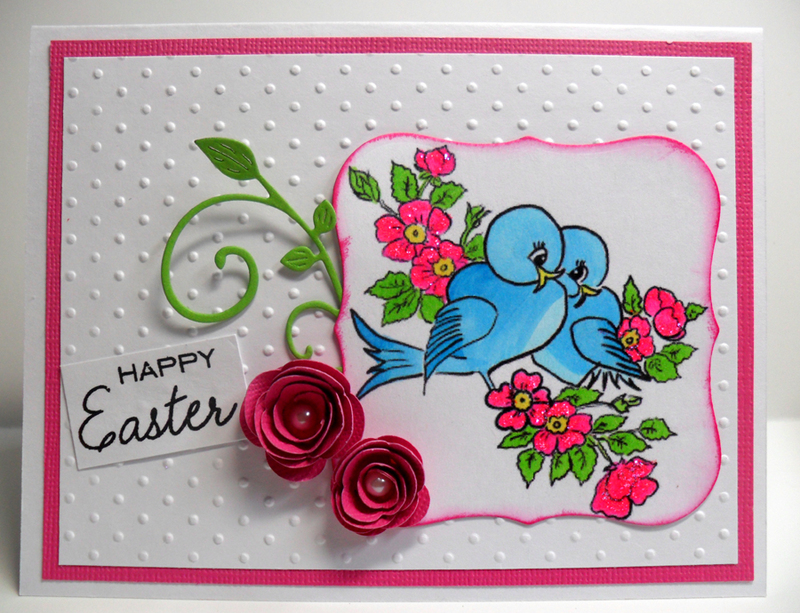 The white background cardstock was embossed with the Swiss Dots embossing folder by Cuttlebug. Very cute card. Love the bright colors.